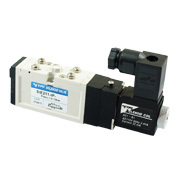 Solenoid Valves from SIE series have identical technical performance parameters as SIV valves, and at the same time have slightly reduced size. SIE series valves as well as SIV valves can be also used with sub-base plates of other manufacturers because they are also produced according to ISO 15407-1 standard. All valves have have meet CE certification requirement. Flow from 700 l/min up to 1000 l/min (with pressure 5 bar, depending on valve size). Built-in manual override in form of a button.